Newcomer Family Obituaries - Richardo G. 'Rickie' Ballez 1993 - 2019 - Newcomer Cremations, Funerals & Receptions. 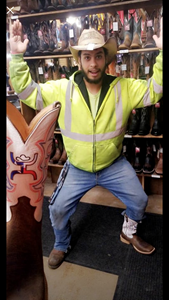 Richardo G. "Rickie" Ballez II, age 25, of Toledo, passed away April 10, 2019 at University of Toledo Medical Center. Rickie was born October 22, 1993 in Bowling Green to Ricardo and Jennifer (Morelock) Ballez. He was employed with Phoenix Technology. Rickie loved to spend time with his friends, being outdoors and hanging out by the campfire. He was an Ohio State and Cleveland Browns fan. He was a person who would help whoever needing a helping hand, even helping out at his friend's farm. Rickie was preceded in death by his grandmother, Yolanda Moreno. He is survived by his mother, Jennifer R. Young, father, Ricardo G. (Jennifer) Ballez, siblings, Michael L. Morelock, Brianna N. Ballez and a baby brother Angel Joe Ballez on the way, grandparents, Millie and Larry Morelock and Able (Linda) Ballez. The family will receive guests Thursday, April 18, 2019 from 2:00 pm - 8:00 pm at Newcomer - SW Chapel, 4752 Heatherdowns Blvd. (419-381-1900). Funeral Services will begin Friday at 10:00 am. at the funeral home followed by burial New Belleville Ridge, Perrysburg. Add your memories to the guest book of Richardo Ballez. We are very sorry for the loss of your Son and we are praying for you and your family at this tragic time. May The Lord comfort you, keep you and fill you with His loving peace especially during the next few days ahead as you lay Rickie to rest.